Inorganic chemistry stands alongside physical and organic chemistry as one of three central pillars of an undergraduate chemistry course. 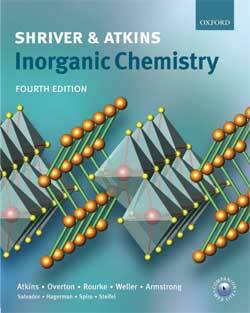 Shriver and Atkins' Inorganic Chemistry fourth edition reaffirms the position of this text at the heart of any student's chemistry education, offering more stimulation, more insights, and more support to help students grasp the fundamentals of this subject than ever before. Peter Atkins has been joined for the fourth edition by a new author team who have drawn upon their excellence in teaching and research to completely revise the book. The authors have increased the accessibility of the text by expanding explanations, using a less formal writing style, and assuming a lower level of mathematical and chemical knowledge, yet have taken care not to sacrifice the depth and rigour of previous editions. They have gone on to extend coverage of the chemistry of the elements, to provide an extensive framework on which students can build their understanding of the subject. The new edition mirrors its predecessors by seeking to inspire students. New 'Frontiers' chapters - including those on materials science, nanotechnology, biological inorganic chemistry and environmental chemistry - open up to the student topics at the forefront of contemporary research, while examples throughout, showing the relevance of inorganic chemistry to real-life situations, encourage students to engage fully with the subject. All these exciting new features and innovations are presented within a new full colour text design, to stimulate and engage students still further. Online Resource Centre: The companion web site contains 3D rotating molecular models, illustrations from the book in electronic format, web links, and additional questions. A solutions manual is available free to adopters. Oxford University Press held a reception in April to celebrate the publications of the new editions of the best-selling Chemistry textbooks Shriver and Atkins Inorganic Chemistry and Atkins' Physical Chemistry. Read the press release here .